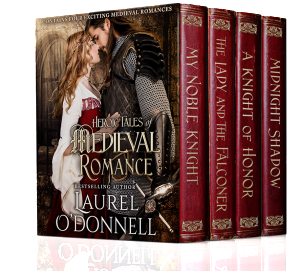 ODONNELL BOOKS - Bringing you a unique mixture of romance and horror! 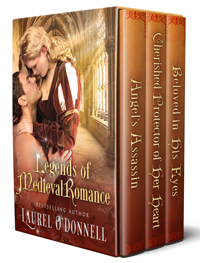 Legends of Medieval Romance: The Complete Angel’s Assassin Trilogy. 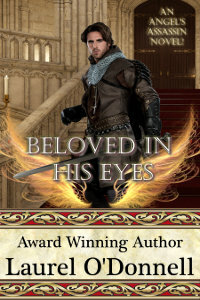 Beloved in His Eyes is Book 3 in the Angel’s Assassin series! Archaeologists unearth the tomb of a mysterious Egyptian ruler and unwittingly discover a secret that threatens to transform all of humanity. 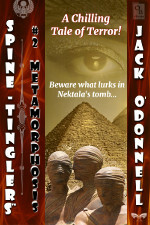 Metamorphosis is the second story in the Spine-Tinglers™ series by Jack O’Donnell, creator of the Land of Fright™ series. Available on numerous ebook platforms. Click here for the Book2Read link to see where the story is available. Author jackPosted on May 12, 2018 Categories UncategorizedTags jack o'donnell, spine-tinglersLeave a comment on Metamorphosis by Jack O’Donnell is available now! This is the sixth collection in the Land of Fright™ series of short horror stories. Land of Fright™ is intended for mature audiences. #51 – Zombie Carnival: Two couples stumble upon a zombie-themed carnival and decide to join the fun. #52 – Going Green: Drug runners trying to double cross their boss get a taste of strong voodoo magic. #53 – Message In A Bottle: A bottle floats onto the beach of a private secluded island with an unnerving message trapped inside. #55 – Who’s Your Daddy? : A lonely schoolteacher is disturbed by how much all of the students in her class look alike. A visit by a mysterious man sheds some light on the curious situation. #56 – Beheaded: In 14th century England, a daughter vows revenge upon those who beheaded her father. 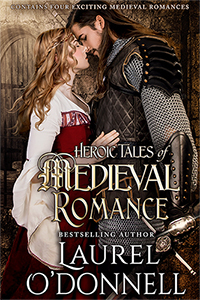 She partners with a lascivious young warlock to restore her family’s honor. #57 – Hold Your Breath: A divorced mother of one confronts the horrible truth behind the myth of holding one’s breath when driving past a cemetery. #58 – Viral: What makes a civilization fall? Volcanoes, earthquakes, or other forces of nature? Barbarous invasions or assaults from hostile forces? Decline from within due to decadence and moral decay? Or could it be something more insidious? #59 – Top Secret: A special forces agent confronts the villainous characters from his past, but discovers something even more dangerous. Trust. #60 – Immortals Must Die: There is no more life force left in the universe. The attainment of immortality has depleted the world of available souls. So what do you do if you are desperate to have a child? 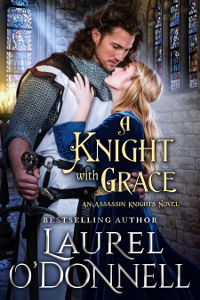 A Knight With Grace by Laurel O’Donnell is now available on Amazon! 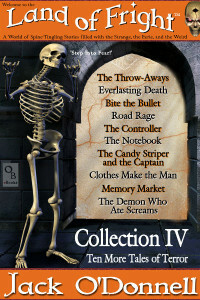 Land of Fright ™ Collection IV by Jack O’Donnell is now available on Amazon. This is the fourth collection in the Land of Fright™ series of short horror stories. Land of Fright™ is intended for mature audiences. #31 – The Throw-Aways: A washed-up writer of action-adventure thrillers is menaced by the ghosts of the characters he has created. #33 – Bite the Bullet: In the Wild West, a desperate outlaw clings to a bullet cursed by a gypsy… because the bullet has his name on it. #34 – Road Rage: A senseless accident on a rural highway sets off a frightening chain of events. #35 – The Controller: A detective investigates a bank robbery that appears to have been carried out by a zombie. #38 – Clothes Make the Man: A down-on-his-luck young man steals a magical suit off of a corpse, desperately hoping some of its power will rub off on him. #40- The Demon Who Ate Screams: A young martial artist battles a vicious demon who feeds on the tormented screams and dying whimpers of his victims. 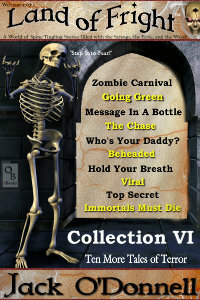 Look for the other Land of Fright™ collections on Amazon! Please note: Land of Fright™ is intended for mature audiences. The ODONNELL BOOKS mini-store on Amazon is now live! You can find all of our ebooks, paperbacks and audiobooks available on Amazon in one easy-to-shop place. The Land of Fright™ series of horror short stories is now available on Amazon! If you are a member of Kindle Unlimited you can read all of the stories in Land of Fright™ for free! Visit the official Land of Fright website to read more about this new series of horror short stories.